For every 25 kg of a fully-fueled launch vehicle, only 1 kg is payload to low earth orbit (LEO). For every 1 kg sent to Mars, there is 100 kg of launch vehicle mass. You want to get back from Mars? That’s another topic. With orbital refueling, it is possible to raise the payload ratio from one percent back to four percent, quadrupling the mass of the vehicle sent to Mars. Unfortunately, LEO is a risky place to have spacecraft lingering for long periods with large amounts of propellant on board. Fortunately, there’s a lot of progress being made recently in all these areas. Payload Ratio is the amount of payload versus the total mass of the vehicle. To get a payload to orbit, typically this ratio is around 25 to 1 (25 tonnes of fully fueled rocket must leave the launch pad for every tonne in Low Earth Orbit, or LEO.) To go beyond Earth orbit into interplanetary space, the ratio is doubled. To land on Mars, the ratio is doubled again, reaching 100:1. Crewed missions to deep space are very large, and therefore the cost of launch vehicles is prohibitive using conventional methods. Orbital Refueling is a way to recover that ratio to something similar to LEO, where we have already built a massive several space stations. A vehicle would be placed in LEO with empty tanks. 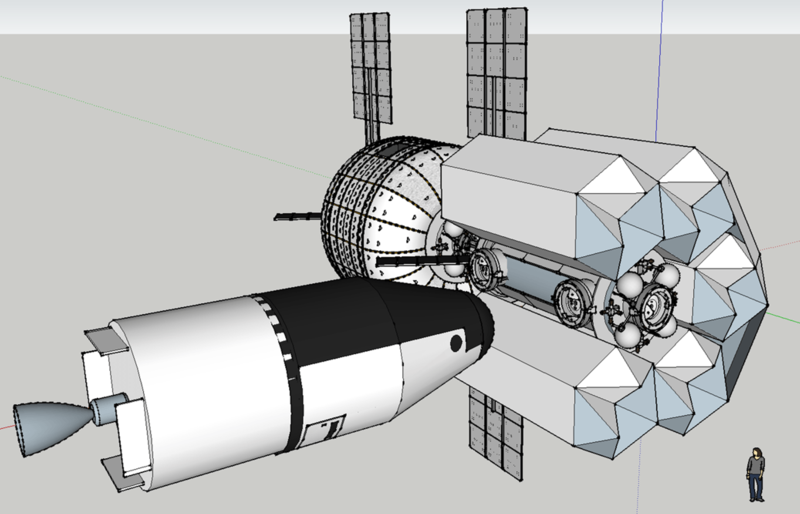 Several follow-on missions would either launch more rocket stages or more fuel for the deep space vehicle. This would make flight into deep space as mature as flight to low earth orbit, provided the technology to transfer propellant exists, and ascent to LEO is affordable for heavy payloads. The problem with this is orbital debris, or space junk. Low to medium earth orbit has the debris from many spent rocket stages, dead satellites, fuel tank explosions, and other mishaps in orbit. This debris eventually falls to Earth, but the fall is much slower (over 100 years) for debris in higher orbits. The problem is severe enough that the International Space Station has extensive shielding to prevent such a collision from destroying it. Were a collision and explosion to occur, it would not only destroy a multi-billion dollar facility, but the debris from the explosion itself would dramatically magnify the risk to future vehicles in LEO. Moving cryogenic propellants in microgravity is also a problem. With room-temperature propellants, you can in theory fill a bag with fuel and then squeeze the bag to pump it regardless of the gravity situation. It’s very difficult to make such a bag if the propellant is the temperature of liquid methane or oxygen, because the bag material would have to stay flexible and non-permeable while frozen to extreme temperatures. The alternative is simple, and was used to restart the engines on the Saturn V third stage for flights to the moon – ullage rockets. Ullage refers to any space in a tank not taken up with liquid. Once in microgravity, propellant either floats or sticks to the sides of the tank. Ullage rockets give a small boost to the vehicle to settle the propellant at the bottom of the tanks before the pumps start drawing from them and the main engines are ignited. For refueling on orbit, the vehicle would have to accelerate (or decelerate) constantly but slowly during the pumping operation. Orbital refueling depots that stay on orbit fully loaded have been proposed since the 1960's. Normally, hydrogen storage in any environment is the molecular equivalent to herding cats. Hydrogen atoms can leak through any container and out into the environment. This leaking hydrogen embrittles aluminum and most other lightweight metals used in rocketry. To keep them liquid, they must be compressed and/or cooled to near absolute zero. Hydrogen also doesn’t “pack” very well. Tanks must be massive to hold even a small mass of hydrogen propellant. The thing Hydrogen has going for it is high specific impulse, which makes it better for high speed flight on upper stages. Most systems are designed to simply let the hydrogen boil away at a reduced rate, but this would eventually defeat the purpose if it boils away from a refueling station faster than it can be replaced. United Launch Alliance has responded to the challenge posed by Falcon 9 and New Glenn with a replacement to the Delta rocket family called Vulcan. This would combine a few ideas from their past research with ideas borrowed from their competitors. One original, and rather impressive, concept is ACES, which stands for Advanced Common Evolved Stage. It is essentially a second stage that can function as a reusable space tug. It also can linger on orbit with propellant reserves for weeks, despite being fueled with liquid hydrogen and liquid oxygen. ACES gets around the problems by using some interesting judo to turn issues into solutions. The tank itself is stainless steel. Normally, this would be too heavy for a rocket stage. But in this application, it makes sense provided it is thin enough. Stainless steel is one of the few metals that does not degrade with protracted exposure to hydrogen. To deal with evaporation, it captures the evaporating hydrogen and oxygen, and then uses them as fuel to drive a compression plant. The hydrogen that is not used to fuel this compressor is then re-liquefied by the compressor and put back in the tank. These solutions add mass to the stage, and the lingering time is still limited by the burn rate of hydrogen and oxygen in the compressor and any other system losses. But it is an impressive solution that tries to overcome these complexities with the added capability of a hydrogen-fueled stage. Gaseous hydrogen and oxygen is also stored in tanks to be used to pressurize the liquid fuel in the tanks. This is called an autogenously pressurized system. This trick is also done by the ITS, below. The gaseous hydrogen and oxygen are also used to provide electrical power for the stage. ACES is three times larger than its predecessor, the Centaur. The beauty of ACES is two-fold. In the near term, it provides a practical, reusable space tug using the most high-powered of propellants. Secondly, it could theoretically be refueled as long as it has access to pure, gaseous hydrogen and oxygen. All the rest of the production infrastructure is on board the ACES. Mining these gasses from water or icy dust is a simple, compact, and cheap process. Desiccating surface material, condensing water, and separating it electrically is trivial. Any future mining system on an asteroid, the moon, or Mars would have this capacity. It would also be simple to encapsulate the propellant management system from ACES and make it an independent propellant plant module. This module would have been tested in space and operational in microgravity. In Elon Musk’s presentation on the Interplanetary Transport System, he proposed launching the massive Interplanetary Spaceship with very little propellant left in the tanks by the time it reaches orbit. A reusable tanker would then be launched repeatedly to dock with the spaceship and re-fill the tanks on orbit four or five times. The propellant is methane and oxygen, which is much easier to store and manage for extended periods. Because the tanker is only on orbit for a few hours or days, it minimizes the risk of a collision with orbital debris. The main spacecraft as well could either depart or raise its orbit to a less risky altitude until the launch window for Mars or another destination opened. A crew awaiting the trip to the moon or beyond could take a last look at Earth before departure, while getting used to life on the vehicle in microgravity. Any maintenance issues could be identified and resolved while spending a few weeks in orbit. The on-orbit tanker to spaceship method makes sense with a very high flight-rate, which is what Space-X is expecting with their future vehicles. Assuming that is true, we would be able to do on-orbit fueling with minimal risk. The question becomes the issue of liquid oxygen. The Falcon 9 FT and future vehicles all use supercooled liquid oxygen to increase the mass of liquid oxygen that can fit in a tank. Doing this on the ground is tricky, but doing it on orbit assumes one has a full (and very powerful) cooling plant on the ship. A spacecraft going to Mars to make its own propellant would need such a plant anyway, and competitor ULA is proposing something similar for ACES in the near term. There is a key military adage, “Two is one and one is none”. There is a far greater chance of something actually happening if more than one company is providing the service. We saw this in the last article with multiple launch providers from different companies being designed for heavy payloads, which could allow satellite providers to move from 20 to 35 metric ton communications satellites. We see it again here with on-orbit propellant management and refueling. While nothing official exists from Blue Origin on this subject, keep in mind they are tightly linked with ULA, and may provide engines for the ACES vehicle. As for space debris, expect fewer large vehicles designed to operate in low earth orbit due to risk. The problem is that the higher you go from LEO, the greater radiation exposure from the earth’s radiation belts. Currently, the space station in LEO has 40 percent of cosmic rays blocked by the Earth, and a small percentage of the lowest-energy cosmic rays deflected by the Earth’s magnetic field. These percentages would drop with altitude. A higher altitude space station would need additional shielding, but this would be good practice, and provide good data, for deep spaceflight. Regardless of altitude, future stations could be more automated to do more science with small crews. Good capability for mining and transport usage. Components can be modularized and sold. On the one hand, there is little funding for ITR and ACES. On the other hand, both projects are on the critical path for both companies, and both companies have spent over a decade working toward these projects as a core goal. The companies themselves would both have to fail for these concepts to die. Ironically, for ULA to survive untransformed, Space-X and Blue Origin would both have to fail. If Space-X or Blue Origin continue as planned, or even at 50 percent their planned velocity, at least one key technology will be flight-proven before 2030. As long as I'm posting on the subject, and it's my web site, here are some of my proposals. In 2011, I’d proposed a refueling depot on orbit that would store hydrogen and oxygen as reinforced ice, more commonly known as Pycre﻿te. At that time, existing concepts were subject to all the drawbacks I’ve mentioned of evaporation, volume, and risk of damage. My design would have also stored methane as a secondary propellant source. It could, if fully fueled, relocate itself slowly to lunar or Martian orbit for use in refueling surface shuttles. More advanced versions were also modula﻿r﻿﻿ and could be expanded into space settlements. A 3.5 meter thick bag of ice also offers excellent protection from cosmic rays and solar flares. I realized that a “Mars shuttle” similar to the ITS could also be fueled for outbound flight, refueled on Mars, fly back to Earth. I’m not claiming credit for the design, but I did announce the technical possibility six years before Elon Musk did ;). ​That said, I've continued work on this and similar concepts for use in space settlements and deep space labs for space settlement development. But that's a topic for a future entry.